Here is this week’s list of blog posts and other links from my favourite corners of the web. I did have a photo to include with it this time. 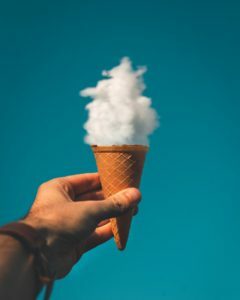 There’s something whimsical about framing a shot in such a way that a cloud looks like a scoop of ice cream in a cone. Also, it matches the first link below perfectly. Deprivation Is NOT the Key to Wellness via CorinneBlogs. I couldn’t agree with this more. Middle Grade Fiction Readers via MichaelTMiyoshi. If you know anything at all about middle grade fiction or how preteens like to read in general, go click on this link and see if you can give Michael some advice. Gratitude for a Quiet Man via AbeLopezAuthor. This was a beautiful essay that I think my readers are really going to like. Made in Canada. There is a growing trend among many Canadians to buy as many products and services from Canadian businesses as possible.I already buy as much locally-grown food as I can, especially during this time of the year when so much produce is in season. I don’t buy other stuff very often, but I’m going to aim for Canadian products first the next time I need a new spatula or something. If any of you are also interested in doing this, go check out the list of Canadian-made products. It’s much bigger than I ever would have imagined! August Morning. Raise your hand if you think this captures warm August mornings perfectly. The Biggest Lie We Still Teach in American History Classes. Those of you who have taken history classes in countries other than the U.S., do you think history courses in those places have the same issue? Science Fiction and Fantasy Readers Make Good Romantic Partners. Yes, I did share this on Twitter a few days ago for those of you who are wondering. It was so good that I had to share it with everyone who isn’t on Twitter as well.